For a lot of people, Twitter is just another silly social network. What can you really do with 140 characters, anyway, besides complain about the weather and live-tweet How to Get Away With Murder? It definitely took me a long time to get on the Twitter train. I only started tweeting because I knew I’d have to do it for my very first internship, and I figured I should know what I was doing. But Twitter is so much more than people realize – it connects you with the whole world. Celebrities, role models, friends – everyone is just a click away. 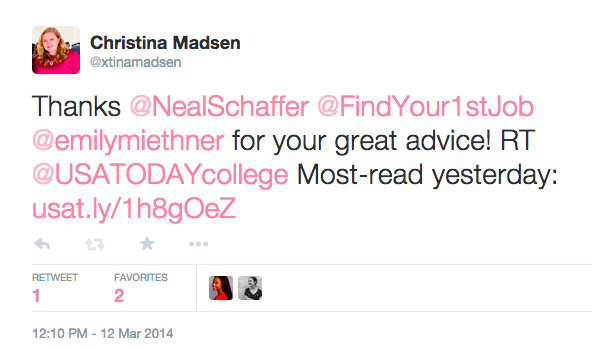 Twitter helped me land my job at FindSpark – yes, really – and I’m not the only one. Here are my tips for taking advantage of this simple, yet powerful, social network to boost your career. In my opinion, keeping your Twitter private means you have something to hide. Let’s say you apply for a job or internship, the recruiter reviewing your application does a quick Google search, and they find your private Twitter. That recruiter is going to wonder what you’re sharing online that can’t be made public. Even if you just prefer not to have so much information about yourself publicly accessible, hiding what you’re sharing can make hiring managers assume the worst. That being said, if you’re going to take your Twitter public, be extremely mindful of what you post – and what you’ve already posted. Delete any old tweets that you might not want a future boss to see, and don’t share anything inappropriate or overly personal. Keep it clean! No matter what industry you work in, Twitter makes it easy to demonstrate your knowledge of the field. Follow major brands and news sources for your industry, and engage with them through retweets and replies. Share relevant content from your favorite sites and participate in conversations about industry news. Anyone who comes across your profile should easily be able to tell what you’re interested in. You only get 160 characters for your Twitter bio, so it has to be short and to-the-point. Because I use Twitter a lot for work, especially to connect with members of the FindSpark community, my job title is the first thing in my bio. Next, I mention organizations I’m involved with that are often points of connection with other people. I like to connect with people who share my interests, and I want those people to connect with me, so those aspects of my life are front-and-center on my profile. Finally, I close off my bio with something less serious that I think sums me up pretty well. Coffee and clothes are my favorite things, so there was no way I’m leaving them out. Bonus points for including a personal website below your bio! If you don’t have a personal website, this is a good place to put your custom LinkedIn URL. If you’re not on LinkedIn, we need to talk. Reach out to role models. Like I said, the amazing thing about Twitter is that it gives you access to everyone. Follow people you admire in your industry, as well as companies you want to work for. Then, once you’ve established your profile, reach out to your professional heroes! They might not always get back to you, but it’s such an easy way to get noticed. This step can really make a difference in your career. It’s not enough to have a nice profile; you have to take action to get noticed. She responded quickly with her email address. I set up an interview and asked her some questions for my article. When that article was republished on USA TODAY College and was their most-read article one day, I made sure to bring that to her attention. Through a couple of short tweets, I established a professional relationship and proved that I was good at my job. When I applied for an internship at FindSpark a few weeks later, I now had Emily’s email address, so I let her know that I was applying. I landed the internship by the end of the month, and now I’m working here full-time. Making your Twitter account professional doesn’t mean you have to lose all aspects of your personality. Figure out what parts of your personality will mesh best with your industry and the companies you want to work for, and let those shine through. For example, I’m always going to be a little weird on Twitter. I love my emojis and I don’t ever plan to stop using them. But I know that’s okay, because plenty of successful people and companies I follow are also incorporating that weirdness into their brands. I know that kind of thing flies in my field, so I embrace it. The most important thing to remember on Twitter is do what works for you and your field. Look to accomplished individuals in your industry for inspiration, and build something you can be proud of. When you’re starting your career, Twitter is an incredible way to get yourself out there. You can establish a personal brand, demonstrate your knowledge of your industry, and get yourself on the radar of companies you want to work for. When you can do all of that for free, there’s no reason not to. How have you used social media for your career? Share with us in the comments! This entry was posted in How To, Networking and tagged career, career projects over break, intern, intern to full-time, internship, LinkedIn, online presence, personal brand, personal website, social media, tweet, twitter by Christina Madsen. Bookmark the permalink. Love this post. Social can be such a valuable tool for showing your expertise and gaining exposure to thought leaders in your industry of choice. Thanks Amanda, I totally agree!